The NNN is a regional collaborative network of scholars working in North American studies at the following twelve universities in Northern Germany: Braunschweig, Bremen, Flensburg, Göttingen, Greifswald, Hannover, Hamburg, Kiel, Lüneburg, Oldenburg, Osnabrück, and Rostock. 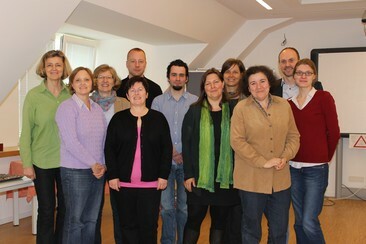 Since May 2013, representatives of Northern German departments of English and North American Studies have met regularly in order to establish and maintain closer cooperation networks in teaching, research, and the coaching of graduate students and post-graduate scholars. The inaugural meeting of the Norddeutsches Netzwerk Nordamerikastudien or Northern German Network of North American Studies – called NNN – took place on May 25, 2013, at Leuphana University Lüneburg. Seven universities were represented at this first meeting: Braunschweig, Bremen, Göttingen, Hannover, Kiel, Lüneburg, Oldenburg. Participants at Leuphana meeting 2013 and founding members of NNN First row: Sabrina Völz (Lüneburg), Brigitte Glaser (Göttingen), Maryann Henck (Lüneburg), María del Carmen Suñén Bernal (Lüneburg), Marie Löffler (Bremen) Second row: Maria Moss (Lüneburg), Jutta Zimmermann (Kiel), Rüdiger Heinze (Braunschweig), Martin Butler (Oldenburg), Kirsten Twelbeck (Hannover), Carsten Junker (Bremen). Among the joint projects that have since taken place are a writing workshop for doctoral candidates (May 23-24, 2014 in Hannover), several lecture series (in Lüneburg and Osnabrück) as well as guest lectures and conferences hosted by members of the NNN network. Further annual meetings took place at Christian-Albrechts-Universität zu Kiel (November 15, 2014), Universität Bremen (November 14, 2015), and Europa-Universität Flensburg (November 5, 2016). In Bremen, it was decided that each meeting will be complemented by a writer or North American Studies scholar. In 2016, our first key note speaker Dr. Franklin Sage (Diné) gave a talk entitled “The Navajo Code Talkers in World War II” at our annual meeting at Europa-Universität Flensburg. On Thanksgiving 2017, the pianist Dr. Katrin Loer gave a talk/musical performance on famous jazz musician and civil rights activist, Nina Simone, at the University of Osnabrück. In late November 2018 we met in Göttingen, where a PhD workshop took place in connection with the annual NNN meeting.